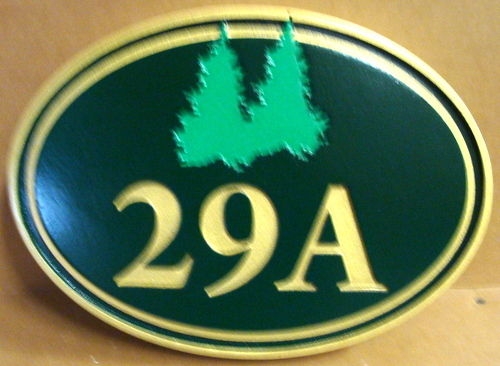 Shown above is a carved HDU elliptical condominum address number plaque sign. This sign has been carved in 2.5-D with 2 levels of relief for the numbers, border and background. The sign's background is then spray-painted and the text, borders and art hand-painted. This outdoor sign is clear-coated twice as extra protection against UV radiation and rain and snow. The sign can be mounted on an entrance door or adjacent wall.